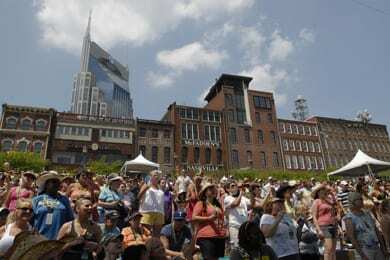 Country fans gather at Riverfront Stage during the 2011 CMA Music Festival. Photo courtesy CMA. Held for free and open to the public June 7-10 in downtown Nashville, CMA Music Festival’s newly revealed Riverfront Stage concert lineup includes a diverse assortment of country hitmakers from the past, present, and future. The performances will kick off at 10 am on June 7 with Average Joes’ Montgomery Gentry. The duo last performed at CMA Music Festival in 2009. Promising newcomers Dustin Lynch and Thomas Rhett will be making debut performances this year. Thurs., June 7: Lee Brice, Colt Ford, Tracy Lawrence, Dustin Lynch, Neal McCoy, Montgomery Gentry, Craig Morgan, Jerrod Niemann, Randy Rogers Band, Josh Thompson, and Uncle Kracker. Fri., June 8: Craig Campbell, The Farm, Gloriana, Jo Dee Messina, David Nail, Oak Ridge Boys, Thomas Rhett, Sawyer Brown, Phil Vassar, and James Wesley. Sat., June 9: Laura Bell Bundy, Edens Edge, Casey James, Lonestar, Love and Theft, Kip Moore, Heidi Newfield, James Otto, Corey Smith, and Mel Tillis. Sun., June 10: Wade Bowen, Brett Eldredge, Larry Gatlin and the Gatlin Brothers, JT Hodges, Steve Holy, Jana Kramer, LoCash Cowboys, Lorrie Morgan, Sunny Sweeney, and Darryl Worley. Four-day ticket holders will have an exclusive 45-minute early-entrance window before the gates open to the general public for all Riverfront shows. Tickets are available here. All artists participate for free, and on their behalf, CMA donates half the net proceeds of the Festival to support music education in Metro Nashville Public Schools through the Keep the Music Playing program. To date, more than $6.1 million has been donated to the program. The total also includes a $1 million endowment gift for the Country Music Hall of Fame and Museum’s Words & Music program.